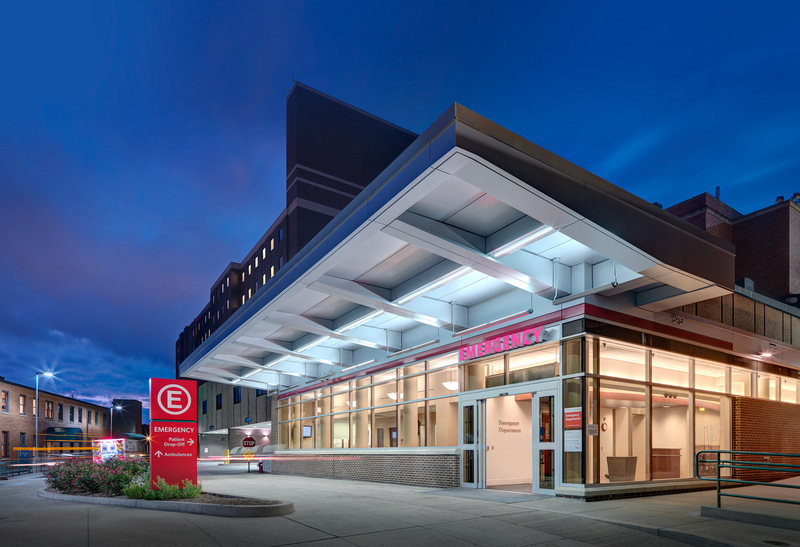 The Emergency Department (ED) at UPMC Shadyside was growing with daily patient volumes nearly doubling. Expansion plans directly impacted ED parking access, queuing and traffic congestion. Trans Associates was retained by UPMC to assess the parking, circulation and access and to make the recommended improvements. The ED driveway was a shared access, accommodating both private and emergency vehicle access. This resulted in vehicular conflict between emergency vehicles and private vehicles. A major improvement was the driveway redesign. The redesign featured separate entrances that incorporated new pavement markings, landscaping and signage which served to alert drivers and separate the ambulances from the private vehicle arrivals. The driveway redesign also alleviated the queuing that occurred when a private vehicle left the driveway to access the parking garage from the public street out front. A valet station was established at the private vehicle access point to allow for a direct valet-only connection from the ED driveway directly into the parking garage. UPMC is reporting 60% improvement on valet efficiencies as a result of this change. On-street queuing was further minimized by repositioning the parking garage entry gates further into the garage. The parking garage layout was also reconfigured to provide operational efficiencies and improved safety for both drivers and pedestrians.